The only sign of culture warring in the whole production is an insert in the day’s program advertising an upcoming Focus on the Family conference on homosexuality in Anchorage called Love Won Out. 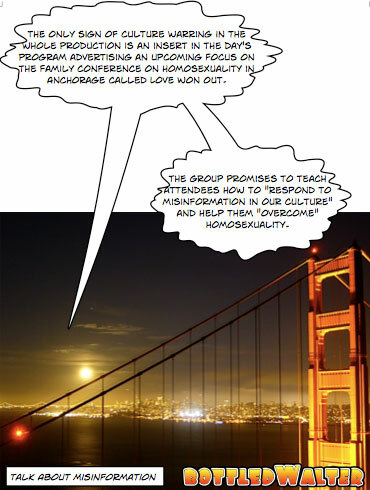 The group promises to teach attendees how to “respond to misinformation in our culture” and help them “overcome” homosexuality. note: Break your religious glasses and take them off. Love is everywhere. Yes, even in homosexual relations.